Looking for a new way to make delicious food while saving energy, traveling in your RV, or expanding your kitchen’s cooking capacity to feed a crowd? A great electric skillet may just be the answer. Like our old friend the slow cooker, the electric skillet adds tons of convenience to your kitchen. Whether you’re looking for an easy way to make lots of food at once without tying up your entire stovetop, or if you’re interested in making home-cooked meals even when a full kitchen isn’t available, an electric skillet can help. Here are a few things to keep in mind as you make your choice. Size – How much food can you cook at once? How much storage space will the electric skillet require? Electric skillets come in a few different sizes and shapes, making it easy to pick the one that suits your requirements best. 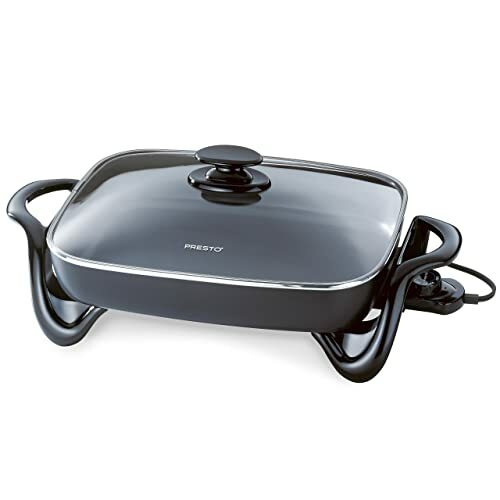 Materials – Many non-stick electric skillets are manufactured without chemicals that come with potential hazards. If you’re concerned about food safety, the best electric skillet might be one that offers a cooking surface that’s free from PFOA and PTFE. Maximum Heating Temperature – Check your recipes to see just how much heat you’ll need to get the results you want. Most of the models we’ve reviewed go all the way up to 400 degrees Fahrenheit, and some go even higher. Returns Policy – Unfortunately, electric skillets are plagued with a few common manufacturing problems – even expensive ones have known issues. Check the returns policy before purchasing, ensuring that a faulty product can be easily replaced if encountered. With these considerations in mind, you’ll find it easier to select the best electric skillet for your needs. The Bella 12-inch square electric skillet features ceramic copper titanium coating, which offers greater durability and faster cooking times than most other non-stick materials. Heat-resistant to 850 degrees Fahrenheit, this coating is free of PTFE and PFOA. The entire skillet is immersible for faster, easier cleanup. A tempered glass lid provides a view of the skillet’s interior. If you’re on a budget and you’re looking for an inexpensive electric skillet, this one is worth considering. At 12×12 inches, it’s a bit smaller than some other options, making it a good choice for small kitchens, as well. The Cuisinart GreenGourmet Electric skillet offers a sleek stainless steel exterior, a versatile round profile, and a 14-inch cooking surface. 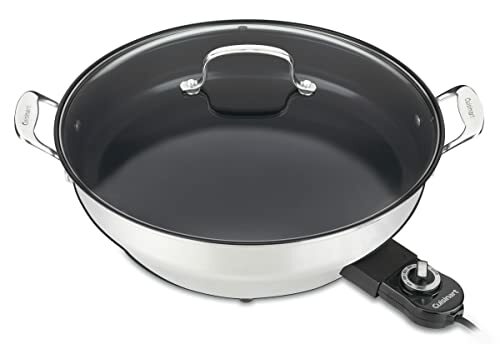 Its nonstick ceramic-based interior is free from PTFE and PFOA, yet it allows for frying, griddling, and braising with less fat. A tempered glass lid is included. This electric skillet offers a maximum heat setting of 450 degrees, and is dishwasher safe. If you’re among those people who prefer a round electric skillet over a square or rectangular one, then be sure to take a look at the Cuisinart GreenGourmet. While it has a couple of known quality control issues that pop up from time to time, most reviewers are thrilled with the skillet’s non-stick surface, its capacity, and its overall quality. The Hamilton Beach Deep Dish Ceramic Skillet offers a PTFE/PFOA free Durathon ceramic nonstick interior. With a roomy 12×15 cooking surface and a depth of three inches, it’s ideal for casseroles, large batches of fried chicken, and much more. A tempered glass lid provides a good view of the interior, and cool-touch handles make for easy repositioning. This electric skillet offers a maximum temperature of 400 degrees Fahrenheit. People who want to cook for a crowd are likely to appreciate this electric skillet. While it has some hot spots, particularly at high temperatures, it does a great job with most recipes, leaving the majority of reviewers satisfied. The De’Longhi BG45 Electric Skillet features a diecast aluminum body, a non-stick interior, and an embedded heating element for greater efficiency and even heating. The tempered glass lid features an adjustable vent, and both the lid and base are dishwasher safe. 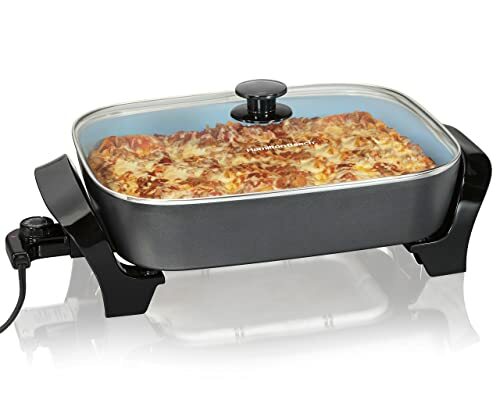 This large electric skillet has a 15 by 11 inch interior, and offers a depth of 3 inches. If you’re looking for a big, cheap electric skillet, you may want to take a chance with this one. 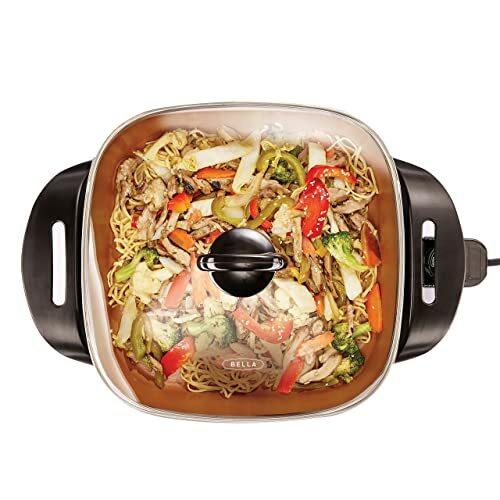 People love the size and dishwasher-safe feature, and most are happy with the nonstick interior. Like all mass-produced products, this one sometimes arrives with manufacturing flaws. With careful maintenance, you might be among the majority, who enjoy cooking a variety of foods for every meal. With a heavy cast-aluminum base and a durable nonstick interior, the Presto 15-inch Electric Skillet comes with a tall, dome shaped cover that helps maintain heat while accommodating large items such as roasts. 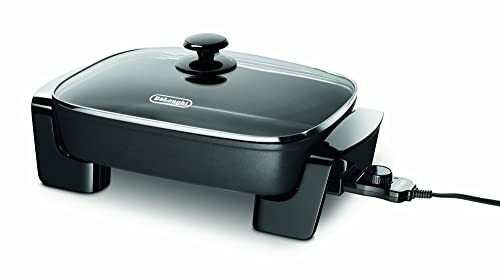 The keep warm feature makes this skillet ideal for buffet use. People who want to roast, grill, fry, and steam a variety of foods are likely to enjoy the Presto 06850 15-inch electric skillet. While it’s not as attractive appearance-wise as some other options are, it makes up for plain looks via consistent, impressive results. A few heavy users report that they cook with this skillet daily and like it so much that they replace it every year or two as the finish wears out with use. 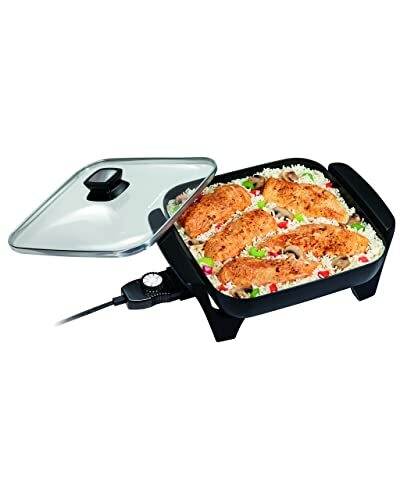 This Presto 16-Inch Electric Skillet comes with a tempered glass cover, offering a good view of items cooking inside. Cleanup is easy thanks to a fully immersible design. Both the base and lid are dishwasher safe. Made with heavy cast aluminum for durability, it features non-stick surface on the interior and exterior, providing easy cleanup. With the heating element removed, this skillet easily goes from countertop cooker to tabletop serveware. If you need to feed a crowd and you’re looking for a large electric skillet that won’t break your budget, then be sure to take a look at this one. Most users are thrilled with its capacity, its performance, and its longevity, as well as its easy cleanup. With pre-seasoning as recommended by the manufacturer, plus a touch of TLC, this skillet is likely to help you create many memorable meals. The Presto 16-Inch Foldaway Electric Skillet lets you roast fry, and stew a variety of items, and is ideal for making easy one-dish meals while using less electricity than an oven or stovetop. A built-in pour spout makes it easier to transfer liquids to storage or serving containers, while serving double duty as a handy spoon rest. A tempered glass cover provides a view of the interior. Fold-down handles detach the skillet’s pan from its base, allowing users to save space by storing the base and handles inside. The skillet base and pan are dishwasher safe when the heating element is detached. People with limited storage space are likely to enjoy this skillet for its practical design. Perfect for small kitchens, it’s also a nice option for RVs. Despite its space-saving features, this electric skillet has the capacity to help you create hearty meals. 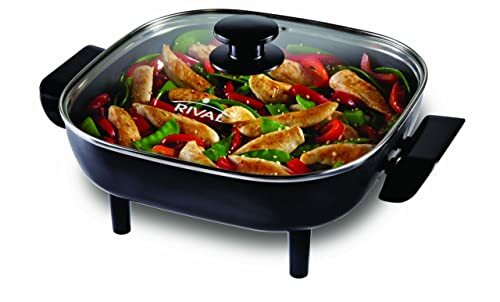 If you find that this is the best electric skillet for your needs, be sure to protect it by placing a soft item between the base and the cooking surface. 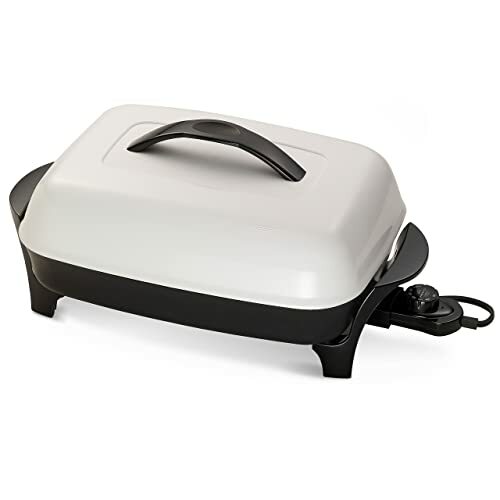 The Proctor Silex Electric Skillet features a medium-sized square profile, with interior measurements at approximately 10.5” x 10.5”. With a non-stick interior and a tempered glass top, it offers plenty of convenience while allowing users to cook a wide variety of foods. Cool-touch handles make it easy to carry the skillet to the table for serving. Easy to hand-wash thanks to a nonstick interior, it is dishwasher safe with the element removed. If you’re looking for the best electric skillet for a small family, you may have found it! 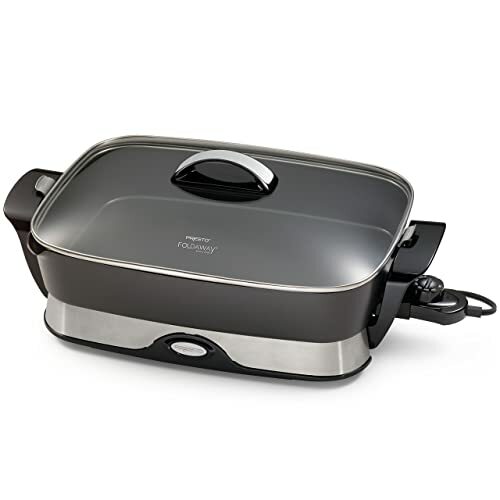 This one offers compact sizing and despite its low price, manages to receive mostly positive reviews from users who enjoy cooking breakfast, lunch, and dinner favorites. Many mention using it in RVs and small apartments. The Rival 11-inch Square Electric Skillet features a nonstick interior and a removable temperature control probe. Dishwasher safe and fully immersible when the probe is removed, it comes with a dishwasher-safe lid made of tempered glass. The lid’s knob offers an integrated steam vent for added convenience. Cool-touch handles make it easy to transfer the skillet from the kitchen to the serving area. Despite some reports of the nonstick surface wearing prematurely, this electric skillet is a favorite with people who want a smaller, more space-conscious alternative to larger models. If you have a small kitchen and you’re cooking for no more than two to three people at a time, it may be exactly what you’re looking for. The Zojirushi Gourmet d’Expert Electric Skillet features an adjustable height steaming plate, a deep-dish inner pan for casseroles, fondues, and stews, as well as a titanium-ceramic coated flat insert for grilling. Stay-cool side handles let users move the skillet easily. A tempered glass lid provides a clear view or items cooking inside. The unit’s round profile offers ample cooking area while saving a bit of space on the countertop. The maximum temperature is 480 degrees Fahrenheit. Designed to please cooks of different nationalities, this electric skillet comes with an instruction manual written in English, Korean, Traditional Chinese, and Japanese. Zojirushi is perhaps best known for it rice cookers, but don’t let preconceptions prevent you from considering this electric skillet. While it’s priced higher than most of its competitors, it offers far more versatility thanks to a trio of inserts that make this three appliances in one. Whether you’re low on space or if you’re a serious tabletop or countertop cook, this may very well be the best electric skillet available. You’ve invested quite a bit of time and effort in your quest to select the best electric skillet for your needs. There’s a little bit of a learning curve when going from the stovetop to an electric skillet. 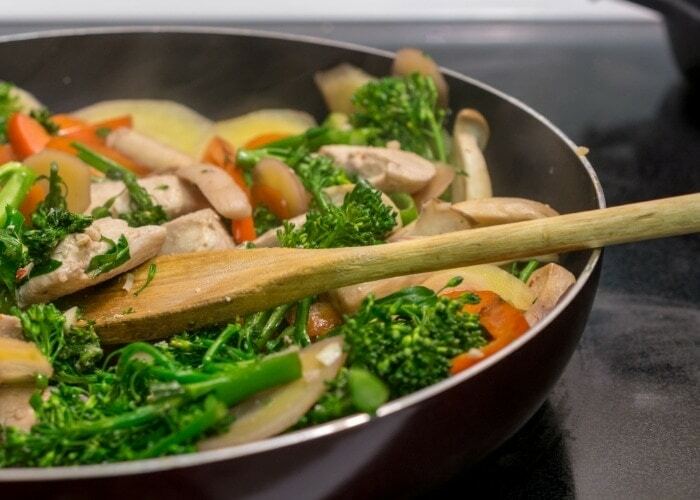 These tips will help you familiarize yourself with your new pan. With just a little practice, you’ll be using it to make a variety of delicious foods. Familiarize Yourself with the Skillet’s Features: Once you’ve chosen your electric skillet, spend a couple of days getting to know it. Make a few meals using different techniques, and try new recipes as well as old favorites! Be sure to keep the owner’s manual so you can refer to it if needed. Many manufacturers make their manuals available online, too. Season Your Electric Skillet: Most electric skillets perform far better when the cooking surface is seasoned, particularly before the first use. Follow the manufacturer’s instructions, and consider re-seasoning your skillet if the non-stick surface starts to lose its slippery feel. Use the Right Tools: Many electric skillets have non-stick interiors. Use the right tools and avoid contact with metal, so your skillet’s nonstick surface lasts longer. Watch Cooking Shows that Feature Electric Skillets: YouTube offers a treasure trove of inspiration for cooking with an electric skillet – Even celebrity chefs like Alton Brown get into the act! Clean Your Electric Skillet Carefully: Let the skillet cool completely before cleaning it, and be sure to remove the control plug. Keep the electrical works out of the water as you wash the skillet with dish soap, unless the manufacturer states that the skillet is immersible. Give it a rinse and wipe it dry. It’s all ready to store until the next use! 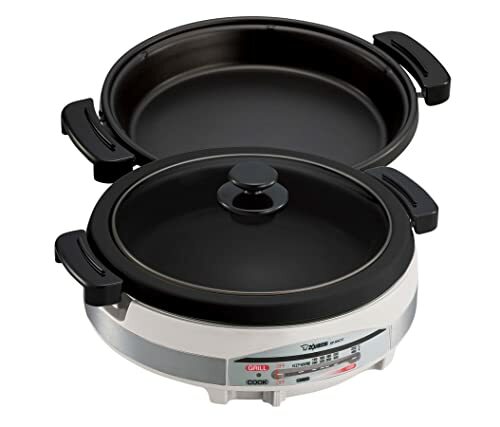 Try Shabu Shabu at Least Once – Electric skillets are great for cooking at the table. Try hosting a couple of friends for a traditional Japanese Shabu Shabu meal, and don’t be surprised if you’re hooked! With these techniques and some easy recipes, you’ll find that it’s simple to cook a variety of foods in your new electric skillet. Best of all, food will turn out tasting and looking amazing. Be sure to follow the manufacturer’s instructions for taking great care of your electric skillet, and it’ll serve you well in return. We wish you success in your next culinary adventure!